So I’ve gone a whole week without posting. I’m SO sorry, fat fashion fans! However, I’m coming back atcha with reviews of the things I used this past week! Aren’t you lucky? I’ve also got a Daily Look coming, plus in the next day I’ll be rounding up my April Faves, a.k.a. the best items of my spending ban so far. This is what I had to work with the past week. It was a mixed bag, once again! Eyeshadow wasn’t so bad this week. 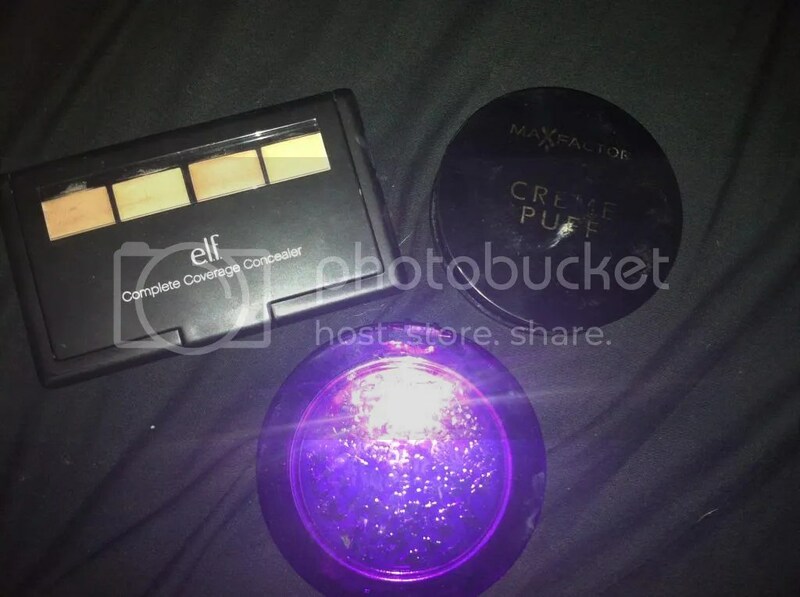 As you can see, the ELF palette offers a good range of neutral and bright colours, all in warm tones which is great for my cool, blue-grey eyes. 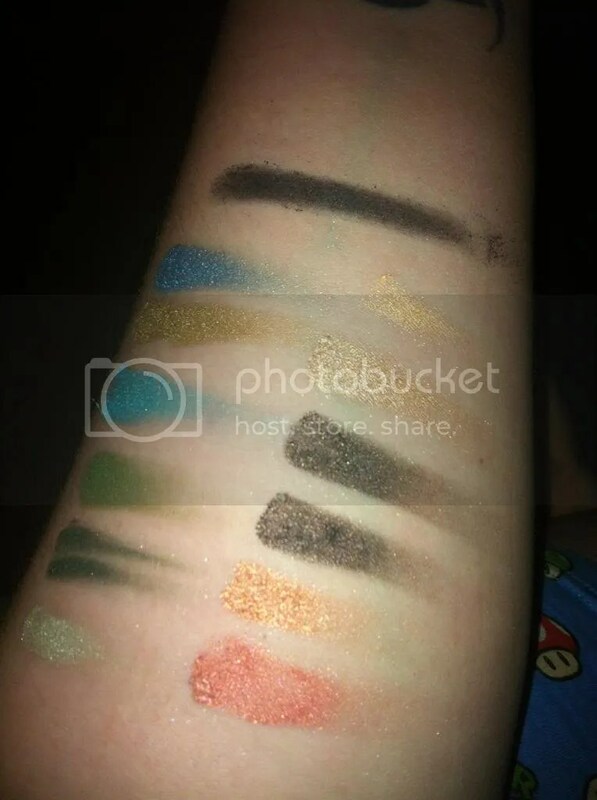 The shadows do vary somewhat in pigmentation as you’ll see in the swatches below, and they don’t last for a massive period of time, but they’re not bad. The Bourjois eyeshadow is pretty good! The colour is pretty sheer, but it does build to a more intense opacity if you want to, and over primer it lasts a reasonable amount of time without creasing. 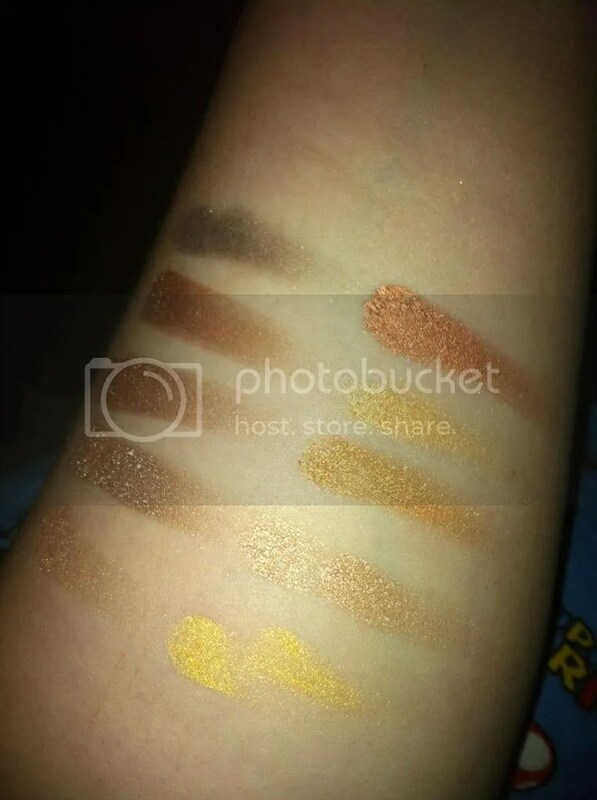 I think you can see the variation on pigmentation here- all of these are swatched without primer and with at least two swipes, but for the price it’s not bad at all. 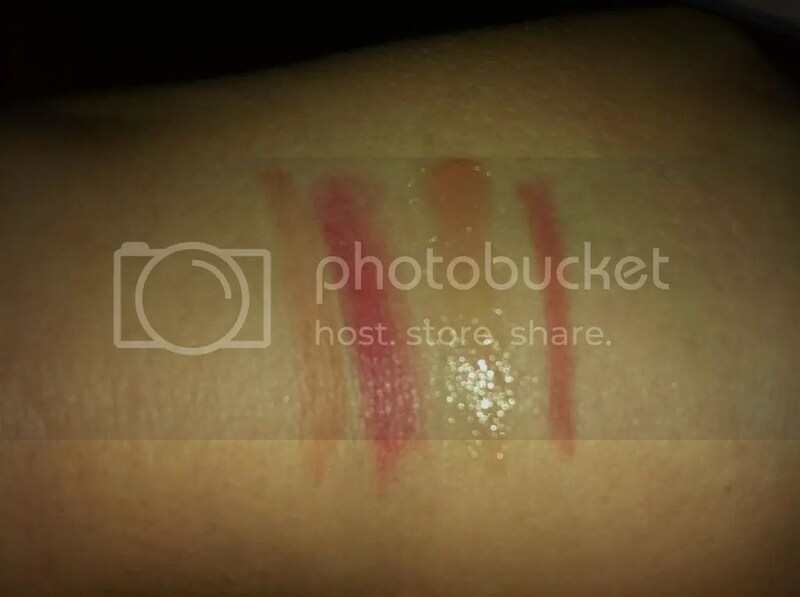 The majority are pretty shimmery which as you’d expect are the best for pigmentation, and there’s a bit of fall-out. Speaking of fall-out, there is a lot with the Ombre Stretch, which you can see! 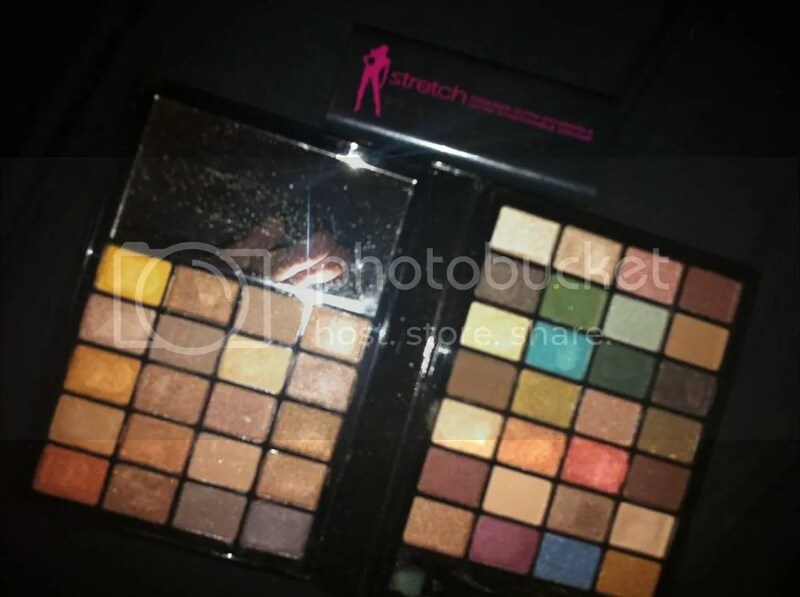 However, the shadow is encased in it’s own, sturdy little case with a secure button opening, and instead of the usual sponge applicator is packaged with a mini brush that is actually pretty good for application. Considering I only paid £1 in Poundland for it, not bad at all! I popped it in my overnight makeup bag when I went to stay with a friend last week and it was perfect for quick and easy the-morning-after application. I don’t think The Falsies gives me a particularly ‘false lash’ effect, however I do think it’s pretty good! It delivers on the blackness and doesn’t really clump, and I found it only took two coats to be reasonably effective. 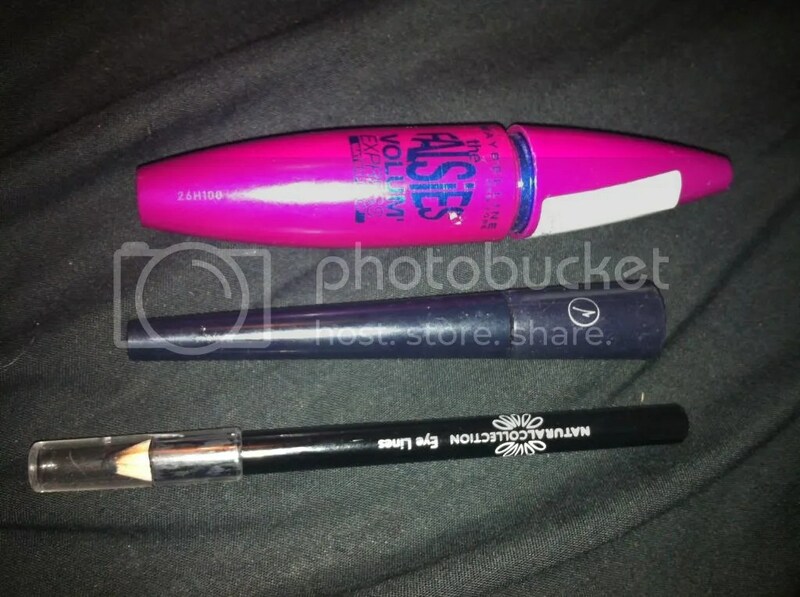 Not a bad mascara but I’m not convinced it delivers as promised! The Virgin Vie liner was a bit of a disaster. The only time I used it, I actually gave up after three attempts at application- it just does not want to dry! 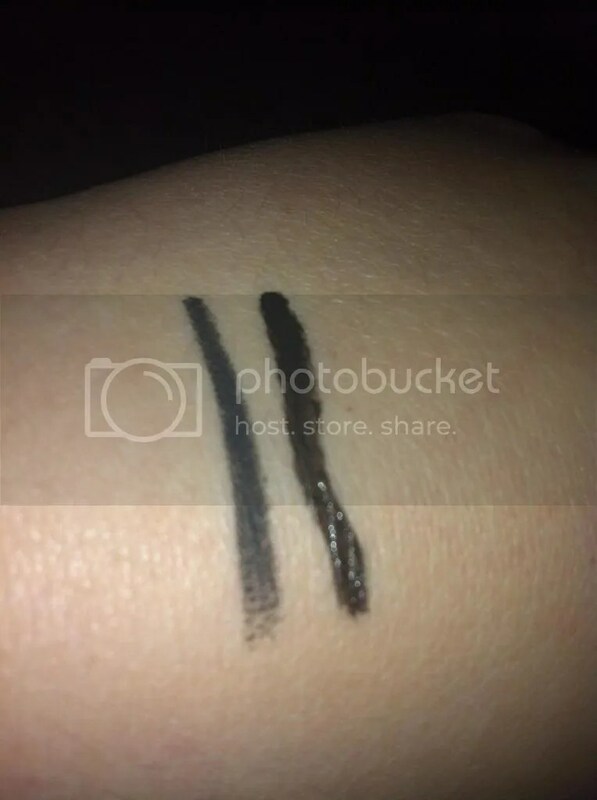 I don’t know if this is an issue I have in general with liquid liners, because if you’ll remember the MUA liquid liner didn’t work for me either, but I’m not sure if I want to try another liquid. The Natural Collection pencil is GREAT. Soft, easy to sharpen and it applies without any drag, delivering a pretty impressive black line for such a cheap pencil. I’m really disappointed that the liquid liner didn’t work, because it’s such a lovely colour and comes with a pretty fool-proof applicator. If anyone can recommend me a liquid liner, please do so! 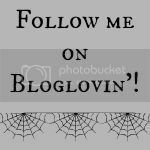 I love all of these products! The Soap and Glory blusher is a really pretty, sheer powder that can be easily built up to give a lovely pop of colour. It’s another of those multi-coloured powders that you use by swirling a brush into it and applying all over the cheeks, blending out towards the temples. It highlights as well, so you don’t really need to use High Beam at the same time… but High Beam is so lovely! 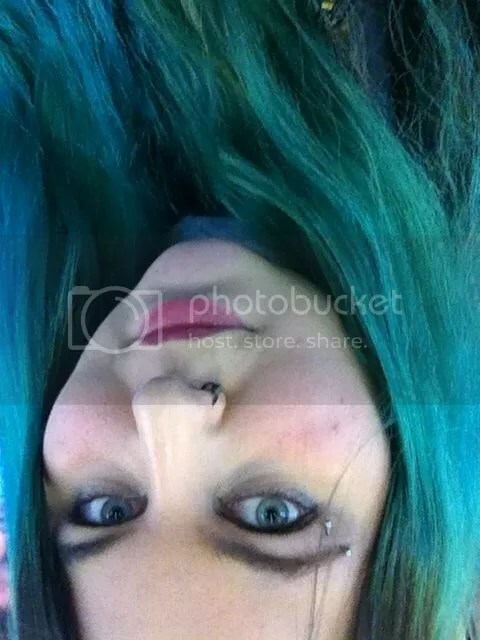 I find it’s especially good at highlighting in the cupid’s bow and down the bridge of your nose. It’s so easy to apply and blends like a dream, and helps to give the perfect sculpted face effect. 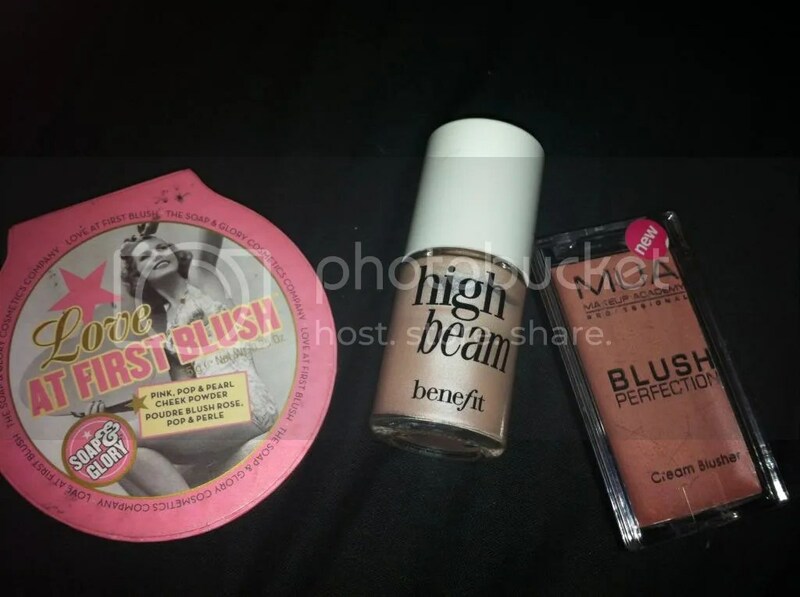 The MUA Blush Perfection blusher is definitely a favourite of mine. It’s a cream blusher and I find it’s best to apply it using a finger- it still has a couple of bristles stuck in it from my first and last attempt to apply using a brush! See how pretty the colours are? 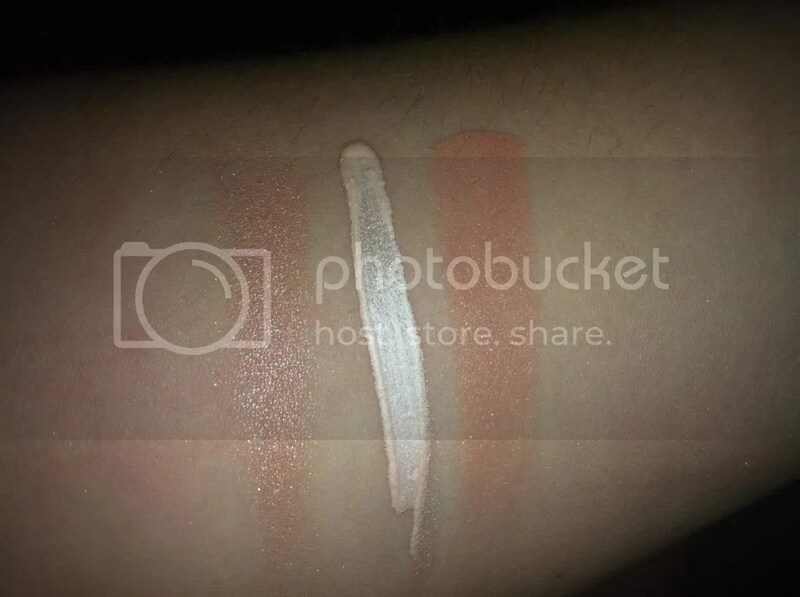 The MUA blusher is for me the perfect peach, and even though it has glitter in it here, that’s just the remnants of my eyeshadow swatching- it’s matte and perfect and I just love it! It blends out and builds so you can give yourself just a touch of dewy colour or a proper catwalk-inspired flush of peach along your cheekbones. It’s all up to how brave you are! I’m not going to comment on the ELF concealer palette because I used it in the first week of my spending ban and raved about it then. However, I would like to start by saying how utterly disappointed in the Urban Decay foundation I am. The packaging is so beautiful, and it comes with a not unreasonable flat brush in a little compartment under the pan. But I just don’t like using it at all. Maybe this mostly stems from the fact that I have no idea how to use the cream-to-powder formula, but I also don’t think it’s a particularly good match for my skin tone. I applied it and it looked scarily like a mask, I had to really, really blend it out and then buff the MaxFactor powder into my skin like a woman possessed. I’m certain the only reason I wasted such a lot of money on it was thanks to the talents of a very talented make up artist at the Urban Decay stand in House of Fraser. I’m not finished with Urban Decay face products, because I’m sure they’d have a product I’d be more comfortable- and confident- using. I’m tempted to head on over to a MAC stand next time I’m in London and getting myself matched with a foundation, it might make the whole ‘colour choosing’ process easier. Having said that, MaxFactor Creme Puff in Truly Fair is the best match for my skin tone, ever. Full stop. I’ve been using it since I was about 13 and it’s perfect. It controls shine and mattefies my face like a dream, it doesn’t look too ghostly, I love it. The closest thing I’ve come to it is the MUA powder which is insane, and I think once this is used up I’ll switch to that. It’s already hitting pan in a big way and I’m sure the change will be so difficult! First things first- the ELF lip tint is awful. It seems to do nothing but make my lips dry. It seems to leave colour when I swatch it on my skin, but as soon as I put it near my lips nothing happens except the most uncomfortable feeling ever. Compared to my MaxFactor Lipfinity tint it doesn’t even come close. The ELF Essentials lipstick in Gypsy, however, is great. It’s a lovely purpley pink colour that is definitely wearable for everyday, and whilst it is a little drying on the lips, it gives a matte finish that lasts pretty well. Dandelion is a gloss that is pretty much the face powder in a lip product! Subtle, shimmery, really pretty. 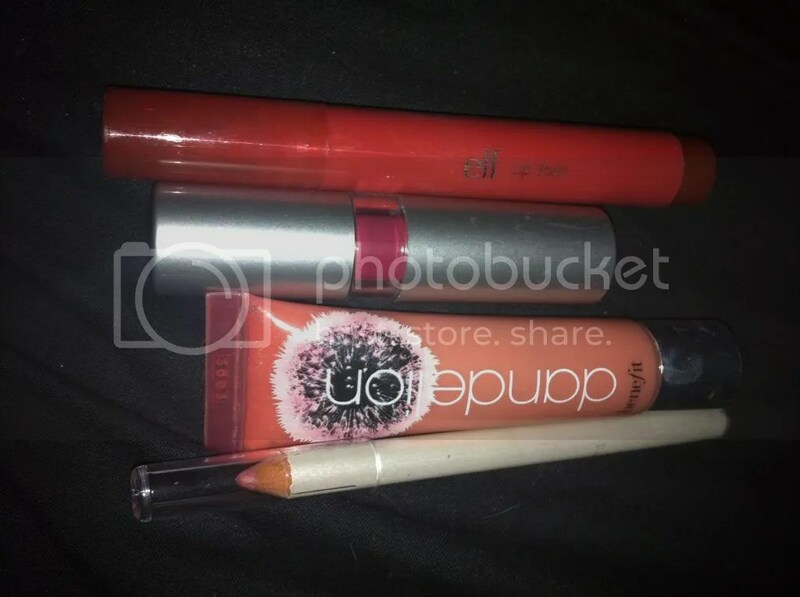 The lip pencil is also great, as you can see from the swatch; it offers a good, neutral colour that is blendable and gives a great base for applying your colour over the top. I think you can see what I meant about ‘a mixed bag’. Here’s a quick look I did using a selection of the products. Do you have anything I used this week? Maybe you had a different experience with them! Let me know. 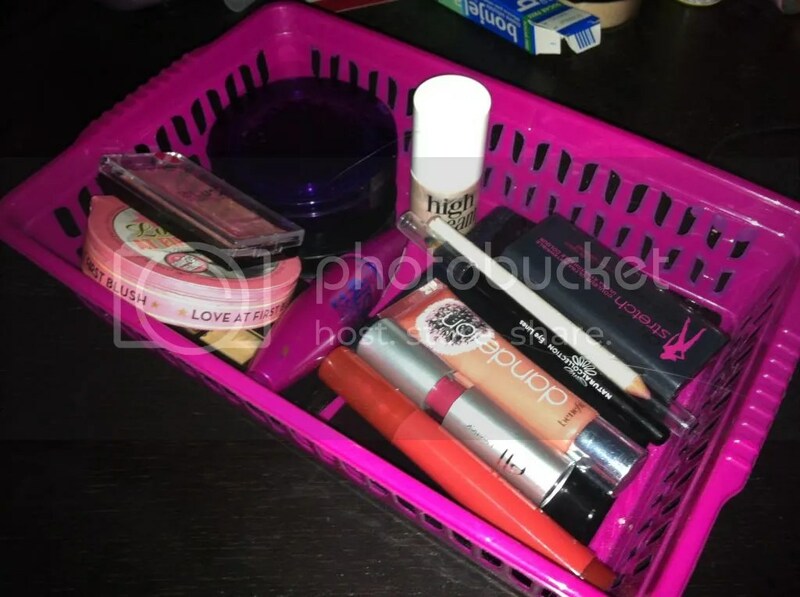 This entry was posted in Beauty, Hair, Makeup, Fashion- Designer, Fashion- High Street, Fashionista Musings and tagged Benefit, Bourjois, ELF, Maxfactor, Maybelline, MUA, Natural Collection, Shopping the stash, soap and glory, Spending ban, Urban Decay, Virgin Vie. Bookmark the permalink.